At this point, I feel like I have a pretty good grip on Ixalan. I've played the cards. I've read the stories. I've even managed to crew a Fell Flagship with a Belligerent Brontodon. Not only was that a landmark moment in the history of alliteration, it put a silly grin on my face for the rest of the afternoon. How did such a massive Dinosaur learn how to run a Pirate ship? Was it taken on board when it was just a pup? Was it trained by one of the Goblins? Does it get to wear a cool head scarf or a tricorn hat? Has it developed a love of Treasure? None of these questions have real answers, of course—at least, none that exist outside of my imagination. I did have some actual, factual questions about Ixalan, though. After rereading all seven stories (go check them out if you haven't done so yet—they're great! ), I put together a list of my top ten questions about the narrative so far. Then I asked the fine folks behind Magic's storyline if they wouldn't mind answering some of them for me. 1) Is the Sun Empire currently at war with the River Heralds? If so, why was Huatli so confident that she would be able to find a Herald to guide her to Orazca? Magic Story Team: Yes! The Sun Empire is currently in a state of expansion against the River Heralds. I wouldn't so much describe it as active warfare, but they definitely seek to annex and reclaim a lot of territory. That said, their expansionist plans were thrown off by the arrival of the Legion of Dusk only a few years ago. Both parties want the vampires gone (the pirates are irritating but not actively looking to set up a fort on the continent), so it is reasonable for Huatli to turn to the River Heralds for help. While they are forces at odds with each other, they also share a common enemy. Huatli is the warrior poet (more or less), so she has a natural charisma that lends itself to reaching across the aisle. 2) Who is behind the binding magic preventing Planeswalkers from leaving Ixalan? Is it a deliberate trap for Planeswalkers, or just the byproduct of some other spell? Magic Story Team: Ooh, the first answer where we get to be coy! It is something that has a very clear answer in the next set. 3) How will Jace react to the rediscovery of his memories? Will it end his budding friendship with Vraska? Magic Story Team: Jace answers the question himself; "You are who you decide to be" is wisdom he passes on to Vraska at a moment when she needs to hear it, and it is wisdom that a part of him still very much believes in. Without his past, without his traumas, that is who Jace is. He is someone who truly believes that identity is a constant search, and that the mutability of destiny is reliant on the choices you make (there's a reason he's mono-blue). In the end, it will be up to him. Does he want to be someone frightened of the mystery of his own past, or accepting of the changes and inconsistencies of life? 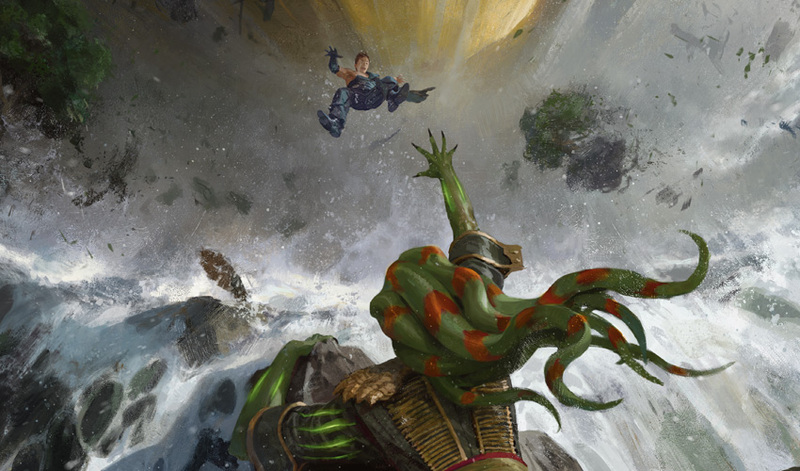 On the other side, you have Vraska, who is very much strapped onto a roller coaster at the end of the Ixalan story. Jace's injury is causing him to have a very violent psychic reaction. He's a telepath. What happens when a telepath receives a telepathic injury? The answer in this case is that not only does his suppressed memory come back in a rush, but his mind can't contain it all, and it is spilling over. He's barfing his own memories for whoever happens to be near. What will Vraska make of Jace's past? And will he be willing to accept her, knowing the past they share? 4) Why did Nicol Bolas choose Vraska, a city-dwelling assassin, to lead his expedition into the wilds of Ixalan? Is it because of her connection to Jace, or is his presence there just a coincidence? Magic Story Team: Nicol Bolas is an expert planner, and one of the best aspects of being an expert project manager is recognizing the potential in your employees. Nicol Bolas sees in Vraska a Planeswalker with lofty ambitions and the people skills to back them up. He sees the kind of leader she can become, so he offers her the one thing she wants most in the world: a path to salvation for the downtrodden in her guild. But that's only part of the answer. There's definitely more there. Jace's presence here is entirely accidental. Nicol Bolas has no clue Jace ended up on Ixalan. 5) What plane is Angrath originally from, and why did he travel to Ixalan? Magic Story Team: Angrath was a family man on a plane we haven't been to yet. He has two adorable daughters, and whenever he wasn't at work as a blacksmith he would travel the Multiverse to bring them back presents. He went away on a weekend holiday years ago and ended up on Ixalan, and when he tried to return home he could not. 6) Is Saint Elenda still alive? If so, what has she been up to for the last couple of generations? Magic Story Team: Vampires do have a habit of not dying, don't they? As for where she is, wherever it is, we have a feeling she has no idea what the Legion of Dusk has gotten up to since she left. 7) Did vampirism exist on Ixalan before the age of Saint Elenda? Does the Legion of Dusk believe that the Immortal Sun will actually cure their vampirism, or just that it will provide a "righteous" immortality for those of their faction who haven't been turned yet? Magic Story Team: Vampirism did not exist on Ixalan before Elenda. She was definitely the first. As for how she became the first, that depends on who tells the story. The Legion of Dusk believes that she used dark magic to give the gift to herself, but Mavren Fein also believes she's nine feet tall, so there's probably something else going on there. The Legion of Dusk believes recovering the Immortal Sun will give them eternal life without the need for blood. They believe the vampires would not need to drink blood any longer, and I imagine everyone else in the Legion of Dusk would be on board to turn to non-gross immortality, too. 8) Who was the "winged beast in the sky" that brought the Immortal Sun from Torrezon to Orazca? Is this the same being as the Last Guardian? Magic Story Team: The winged beast who took the Immortal Sun is known to the River Heralds as the Last Guardian. Huatli could probably tell you another winged beast was known to the Sun Empire by a different name in a different story. Whoever that guy was sure was busy! 9) What happened the last time the Immortal Sun was, in Kopala's words, "misused by mortals"? The Inner Sea sure looks a lot like a massive impact crater . . .
Magic Story Team: When the Sun Empire was in possession of the Immortal Sun, they built the incredible city of Orazca and ushered in a new age of prosperity and growth for their people. But eventually one of their emperors used it for evil purposes. 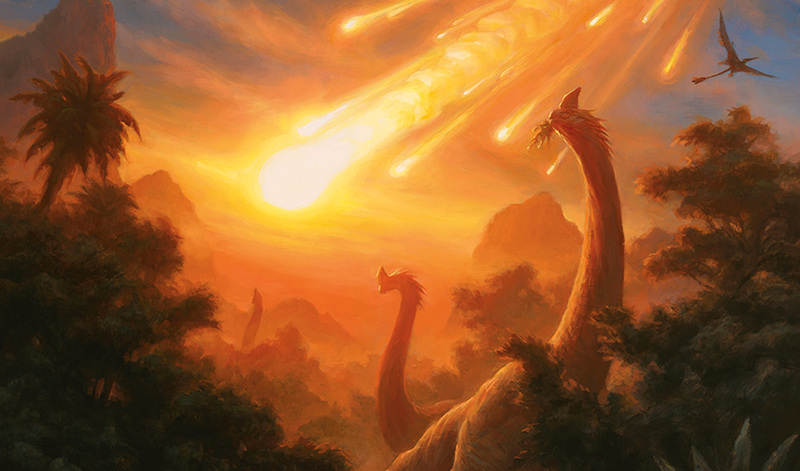 The art on Star of Extinction does portray a meteor, but it didn't kill off all the dinos (and it's not a premonition of the destruction of Ixalan—don't worry—it's just a representation of the power that crummy old emperor wielded when he had the Immortal Sun). That said, the Inner Sea was not caused by a meteor, at least not when any people or land-walking critters were around. It's not an essential part of modern Ixalan history or anything. Ask a geologist. 10) What is the Immortal Sun, and why does Nicol Bolas want it so badly? Magic Story Team: It's a super-duper powerful artifact, and Nicol Bolas has one very specific use in mind for it. We may not have gotten all the answers we wanted, but that's okay—I feel much closer to Ixalan and its inhabitants now. Also, there is still another set full of Vampires, Pirates, Dinosaurs, Merfolk, and an unresolved search for lost treasure. There's plenty of story left to come, and I can't wait to devour it. In the meantime, we can always use our imaginations to fill in the gaps. Hmm . . . I wonder what that ship-savvy Dinosaur is up to right about now.